Update, July 5th: The insertion burn on July 4th/5th was successful, and Juno is safely in its initial orbit around Jupiter. I’ll have an update on the mission in the next Space Sunday. rAt 20:18 PDT on Monday, July 4th (03:18 UT, Tuesday, July 5th) a spacecraft called Juno will fire its UK-built Leros-1b engine to commence a 35-minute burn designed to allow the spacecraft enter an initial orbit around the largest planet in the solar system, ready to begin a comprehensive science campaign. As I write this, the craft is already inside the orbit of Callisto, the furthest of Jupiter’s four massive Galilean satellites, which orbits the planet at a distance of roughly 1.88 million kilometres. During the early hours of July 4th, (PDT), the vehicle will cross the orbits of the remaining three Galilean satellites, Ganyemede, Europa and Io, prior to commencing its orbital insertion burn. In the run-up to the burn, Juno will complete a series of manoeuvres designed to correctly orient itself to fire the Leros-1b, which will be the third of four planned uses of the engine in order to get the craft into its final science orbit. Two previous burns of the engine – which NASA regards as one of the most reliable deep space probe motors they can obtain – in 2012 ensured the craft was on the correct trajectory from this phase of the mission. Getting into orbit around Jupiter isn’t particularly easy. The planet has a huge gravity well – 2.5 times greater than Earth’s. This means that an approaching spacecraft is effectively running “downhill” as it approaches the planet, accelerating all the way. In Juno’s case, this means that as the vehicle passes north-to-south around Jupiter for the first time, it will reach a velocity of nigh-on 250,000 kph (156,000 mph), making it one of the fastest human-made objects ever. Slowing the vehicle directly into a science orbit from these kinds of velocities would take an inordinate amount of fuel, so the July 4th manoeuvre isn’t intended to do this. Instead, it is designed to hold the vehicle’s peak accelerate at a point where although it will be thrown around Jupiter and back into space, it will be going “uphill” against Jupiter’s gravity well, decelerating all the time. So much so, that at around 8 million kilometres (5 million miles) away from Jupiter, and travelling at just 1,933 kph (1,208 mph), Juno will start to “fall back” towards Jupiter, once more accelerating under gravity, to loop around the planet a second time on August 27th, coming to within (4,200 km (2,600 mi) of Jupiter’s cloud tops, before looping back out into space. On October 19th, Juno will complete the second of these highly elliptical orbits, coming to within 4,185 km (2,620 mi) of the Jovian cloud tops as it completes a final 22-minute burn of the Leros-1b motor. This will be sufficient for Jupiter’s gravity to swing Juno into an elliptical 14-orbit around the planet, passing just 4,185 km from Jupiter at its closest approach before flying out to 3.2 million kilometres (2 million miles) at it’s furthest from the planet. The July 4th insertion burn is also significant in that it marks the end of a 5-year interplanetary journey for Juno, which has seen the vehicle cover a distance of 2.8 billion km (1.74 billion miles). It’s a voyage which began on August 5th, 2011, atop a United Launch Alliance (ULA) Atlas V, launched from Cape Canaveral Air Force Station, Florida. As powerful as it is, the Atlas isn’t powerful enough to send a payload like Juno directly to Jupiter. Instead, the craft flew out beyond the orbit of Mars before dropping back to Earth, passing us again in October 2013 and using Earth’s gravity to both accelerate and to slingshot itself into a Jupiter transfer orbit. Juno is not the first mission to Jupiter, but it is only the second orbital mission to the giant of the solar system. The Jovian system was first briefly visited by Pioneer 10 in 1973, followed by Pioneer 11 a year later. Both of these were deep space missions (which are still continuing today), destined to continue outward through the solar system and into interstellar space beyond. They were followed by the Voyager 1 and Voyager 2 missions in January and July 1979 respectively, again en route for interstellar space by way of the outer solar system. In 1992 the Ulysses solar mission used Jupiter as a “slingshot” to curve itself up into a polar orbit around the Sun. Then in 2000, the Cassini mission used Jupiter’s immense gravity to accelerate and “bend” itself towards Saturn, its intended destination. 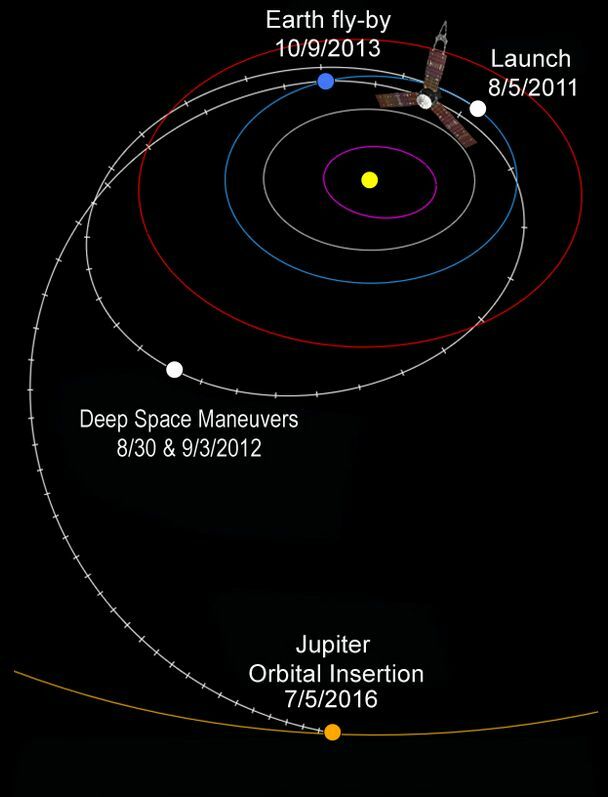 New Horizons similarly used Jupiter for a “gravity assist” push in 2007, while en route to Pluto / Charon and the Kuiper Belt beyond. It was in 1995 that the first orbital mission reached Jupiter and its moons. The nuclear RTG-powered Galileo was intended to study Jupiter for just 24 months. However, it remained largely operational until late 2002 before the intense radiation fields around the planet took their final toll on the vehicle’s systems. Already blind, and with fuel supplies dwindling, Galileo was ordered to crash into the upper limits of Jupiter’s atmosphere in 2003, where it burned up. In the eight years it operated around Jupiter, Galileo complete changed our perspective on the planet. Juno has a 20-month primary mission, and it is hoped its impact on our understanding of Jupiter will be greater than Galileo’s. However, it is unlikely the mission will be extended. Unlike all of NASA’s previous missions beyond the orbit of Mars, which have used RTG power units, Juno is entirely solar-powered, making it the farthest solar-powered trip in the history of space exploration. However, the three 8.9 metre (29 ft) long, 2.7 metre (8.9 ft) wide solar panels are particularly vulnerable to the ravages of radiation around Jupiter, and it is anticipated that by February 2018, their performance will have degraded to a point where they can no longer generate the levels of electrical energy required to keep the craft functioning – if indeed, its science instruments and electronics haven’t also been damaged beyond use by radiation. This being the case, Juno will be commanded to fly into Jupiter’s upper atmosphere and burn up. 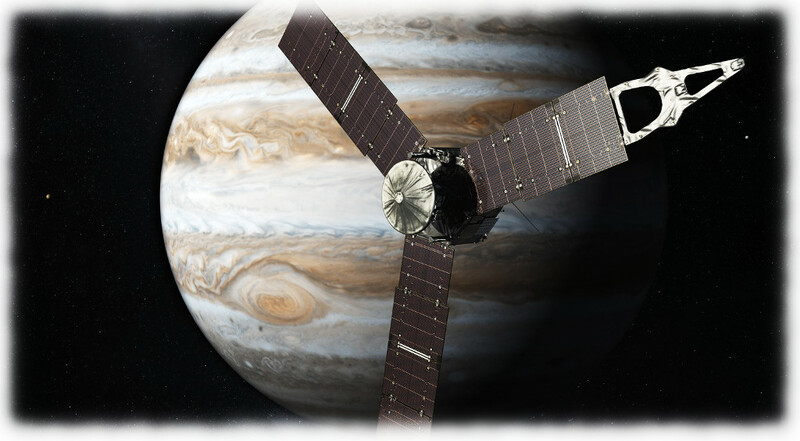 Juno is the name of the NASA deep space vehicle due to rendezvous with Jupiter in July 2016. Launched August 5th, 2011, from Cape Canaveral Air Force Station, the mission is designed to study Jupiter’s composition, gravity field, magnetic field, and polar magnetosphere, as well as seeking evidence and clues on how the planet formed, including whether it has a solid core, the amount of water present within the deep atmosphere, how its mass is distributed, and its deep winds, which can reach speeds of 618 kilometres per hour (384 mph). 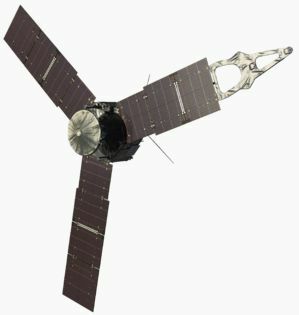 Unlike most vehicles designed to operate beyond the orbit of Mars, which tend to utilise radioisotope thermoelectric generators (RTGs) to produce their electrical power, Juno uses three massive solar arrays, the largest ever deployed on a planetary probe, which play an integral role in stabilising the spacecraft. 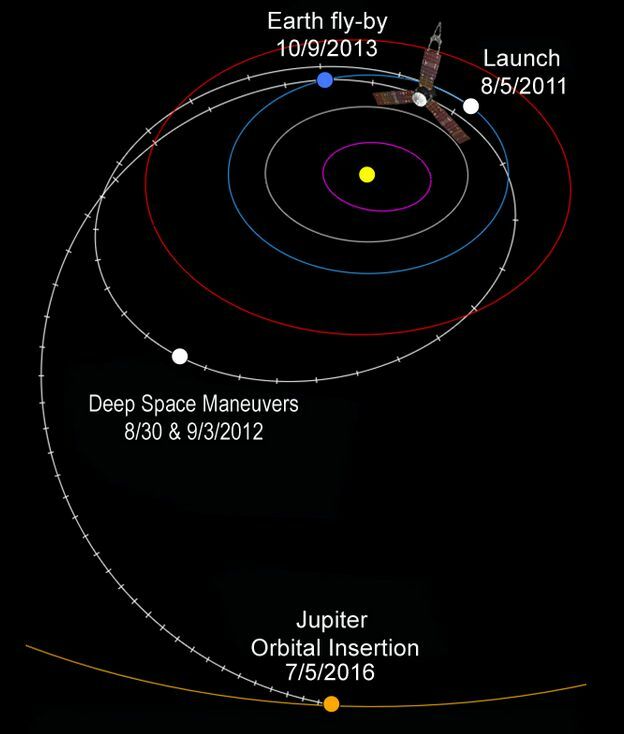 On arrival at Jupiter on July 4th, 2016, Juno will enter a 14-day polar orbit around the planet, where it will remain through the duration of the mission, which should last until February 2018, when the vehicle, fuel for its manoeuvring systems almost depleted, will be commanded to perform a de-orbit manoeuvre and burn-up in Jupiter’s upper atmosphere. 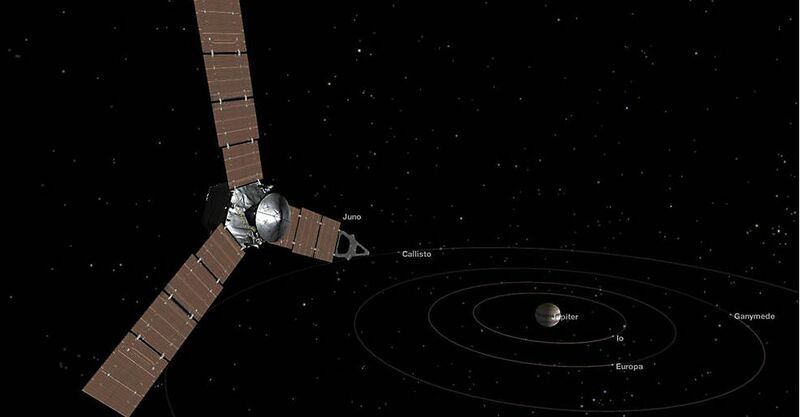 Currently travelling at some 25 kilometres per second relative to the Earth and 7.6 kilometres per second relative to the Sun, Juno has used a 5-year gravity assist mission to reach its destination. The first part of this saw the craft launched into an extended orbit about Earth which carried it beyond the orbit of Mars (2012), before swinging back to make a close flyby of Earth in 2013 which both used Earth’s gravity well to accelerate the craft and as a “slingshot” to curve it onto a trajectory that would carry it to Jupiter. By the time Juno enters orbit around Jupiter, it will have travelled some 2.8 billion kilometres (1.74 billion miles, or 18.7 AU). Juno’s planned polar orbit is highly elliptical and takes it to within 4,300 kilometres (2,672 mi) of either pole at its closest approach to the planet, while at its furthest point from Jupiter, it will be beyond the orbit of Callisto, hence the 14–day orbital period. This extreme orbit allows Juno to avoid any long-term contact with Jupiter’s powerful radiation belts, which might otherwise cause significant damage to the vehicle’s solar power arrays and electronics. 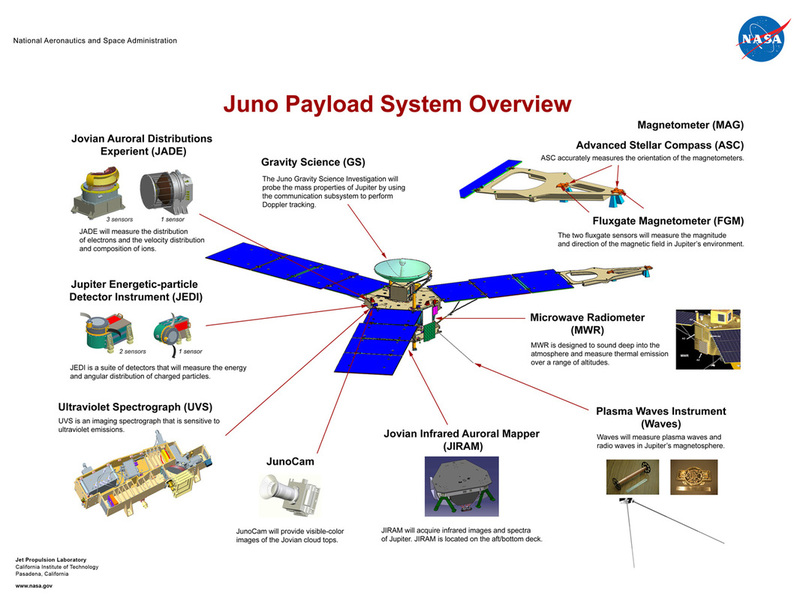 Overall, Juno will receive much lower levels of radiation exposure than the Galileo mission. But even allowing for this, there is no guarantee the exposed science instruments on the vehicle will last the full duration of the mission. Scientists and engineers are hoping the JunoCam and Jovian Infra-red Auroral Mapper (JIRAM), will last at least eight of the mission’s 37 orbits of Juptier, and that the microwave radiometer will survive for at least eleven orbits.On Wednesday February 3rd, 2016, the vehicle completed the first of two final manoeuvres designed to correctly align it with its intended point of orbital insertion around Jupiter. The second such manoeuvre will take just before Juno is due to arrive at Jupiter. The spacecraft’s name comes from Greco-Roman mythology. The god Jupiter drew a veil of clouds around himself to hide his mischief, but his wife, the goddess Juno, was able to peer through the clouds and see Jupiter’s true nature – just as it is hoped the mission will probe deep into the planet’s atmosphere and reveal its true nature and origins. Now set for launch in September 2018 on a circumlunar mission lasting 20 days, the second Orion space vehicle arrived at Kennedy Space Centre, Florida, on Wednesday, February 3rd, 2016. The vehicle, sans its outer skin and massing 1.22 tonnes, arrived from NASA’s assembly facility iin Louisiana by air aboard the agency’s “Super Guppy” transporter, which has been transporting space vehicle components since the Apollo era. Further construction activities and a variety of tests will be performed at KSC and NASA’s Glenn Research Centre in Ohio to prepare the craft for its mission, officially titled Exploration Mission 1 (EM-1). This will see the uncrewed Orion launched for the first time with and operational, European-built Service Module atop its dedicated Space Launch System (SLS) rocket. The flight will see the Orion system launched into Earth orbit, where a purpose-built upper stage propulsion unit will power the craft onto a flight towards the Moon. Orion will use the relatively low lunar gravity to both accelerate it and throw it into an elliptical orbit, carrying it a further 70,000 kilometres beyond the Moon – almost half a million kilometres (312,500 miles) from Earth – further than any space vehicle designed to carry humans has yet flown. Following this, the vehicle will swing back towards Earth, passing the Moon once more before the Command Module separates from the Service Module to make a controlled entry into Earth’s atmosphere and a splashdown in the Pacific Ocean. The flight will be a comprehensive test of the European-built Service Module, which is vital for providing power and propulsion to the Orion capsule, and which is being built using the expertise Europe gained in building and operating the Automated Transfer Vehicle, which remains the largest ISS resupply vehicle so far used in space. The Service Module includes four post-launch deployable solar panels for electrical power, and provides power, heat rejection, the in-space propulsion capability for orbital transfer, attitude control and high-altitude ascent aborts. It also houses water, oxygen and nitrogen for deep space missions. 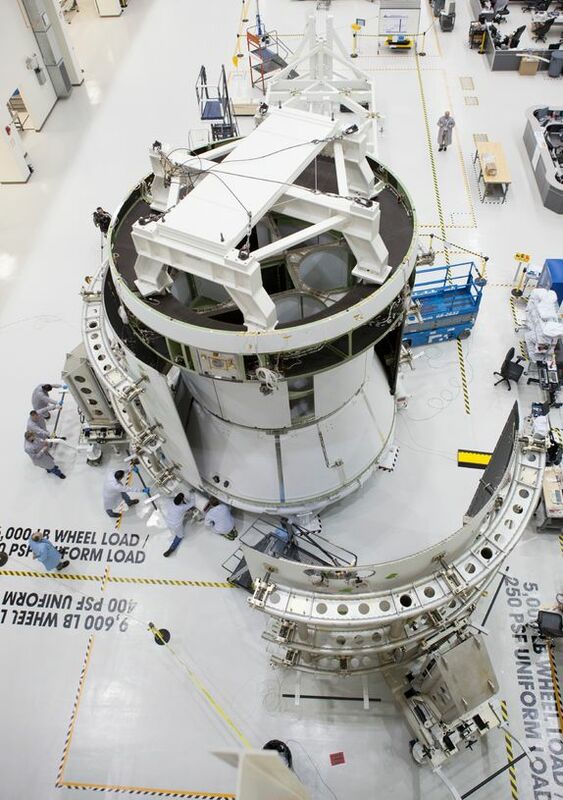 Like the Apollo Command and Service modules vehicles, the Orion capsule sits on top of the Service Module at launch, covered by the launch abort system shroud, the service Module protected by special payload fairings and mated to the SLS upper stage propulsion unit. The launch abort system and the fairings are jettisoned once the Orion has reached low Earth obit and has separated from the rest of the SLS booster. The Service Module solar panels are then deployed, and the upper stage of the booster re-fires, sending Orion on its way. The 2018 mission will be followed in 2023 by a similar flight, this time carrying a crew of four further into space than any humans have ever previously been. Together, Orion and the SLS are intended to be the backbone of America’s return to the moon and for human missions to Mars. Just when you thought images of Pluto returned by the New Horizons spacecraft could get any more awe-inspiring, NASA / JHU APL release a set of raw images that are utterly stunning. The images come from the wide-angle Ralph/Multispectral Visual Imaging Camera (MVIC) on the space craft and were captured just 15 minutes after the vehicle reached is point of closest approach to the little world, and thus from a distance of just 18,000 km (11,000 miles) from Pluto. The stunning vistas presented in the image show the ice plains of “Sputnik Planum” bordered to the left and from below by Pluto’s huge mountain ranges, informally named Hillary and Norgay, Montes after the first partnership to successful reach the summit of Mt. Everest here on Earth. 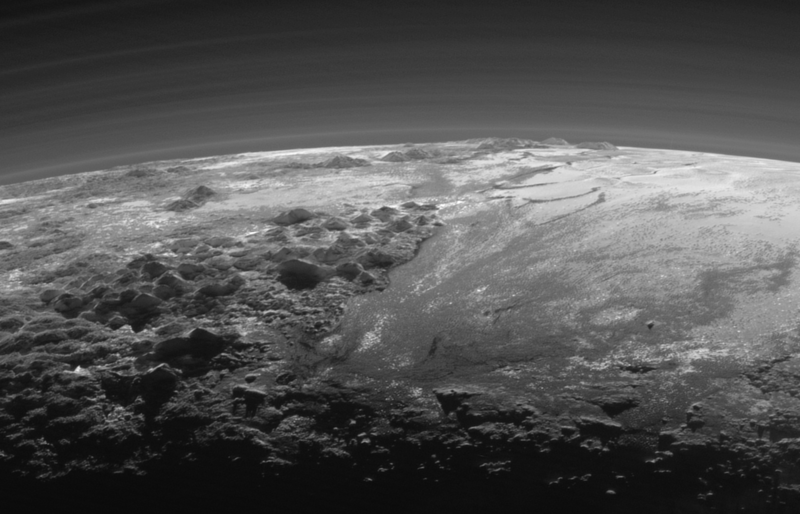 All of this is dramatically backlit by sunlight reflected through Pluto’s hazy atmosphere to create a wonderful scene said to be reminiscent of views of the Antarctic viewed from space or very high altitude. However, the images aren’t just notable for the panoramic beauty; they actually reveal a lot about what is happening in the Plutoian atmosphere. Because of the back lighting from the Sun, the high-resolution MVIC has revealed just how complex Pluto’s atmosphere is, comprising multiple layers of nitrogen and other gases rising to around 100 km (60 mi) above Pluto’s surface (and visible as a banding in the images above). “In addition to being visually stunning, these low-lying hazes hint at the weather changing from day-to-day on Pluto, just like it does here on Earth,” said Will Grundy, lead of the New Horizons Composition team from Lowell Observatory, Flagstaff, Arizona. What is also exciting the science team is evidence within the images for Pluto having a complex “hydrological” cycle which seems to be comparable in some ways to that found on Earth – only on Pluto, it involves nitrogen ice, rather than water ice. 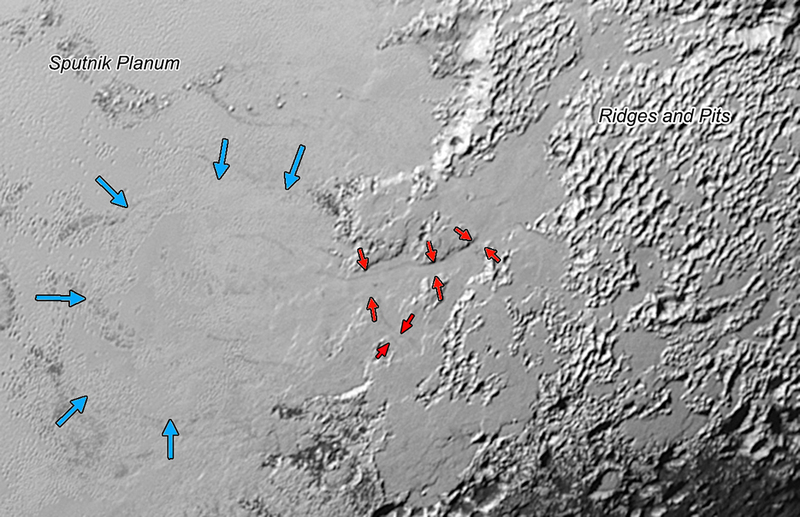 When compared with images captured as New Horizons approached Pluto, the MVIC images further suggest that the regions eastward of “Sputnik Planum” appear to have been encroached over time by ices and material possibly evaporated from the surface of “Sputnik Planum” to be deposited on the higher lands as a new ice blanket, which in turn appears to have formed glacial formations flowing back into “Sputnik Planum”. We’re all familiar with the idea that the solar system is so vast, that it is almost impossible to show the Sun and the major planets proportional to one another and at a scale where all the later are both visible and have orbits which can be adequately encompassed in an easily viewable space. Obviously, some models do exist; the Lowell Observatory in Arizona, USA, for example, has a walk that allows visitors to travel from the sun and by each of the planets, but it’s not always easy to clearly grasp the sheer scale of things. The same goes for digital models (and a few have been built within virtual worlds like Second Life). With this issue of scale and proportion in mind, Wylie Overstreet and Alex Gorosh set out to produce a scale model of the solar system that might help people understand just how vast our planetary back yard is when looked at on a human scale. 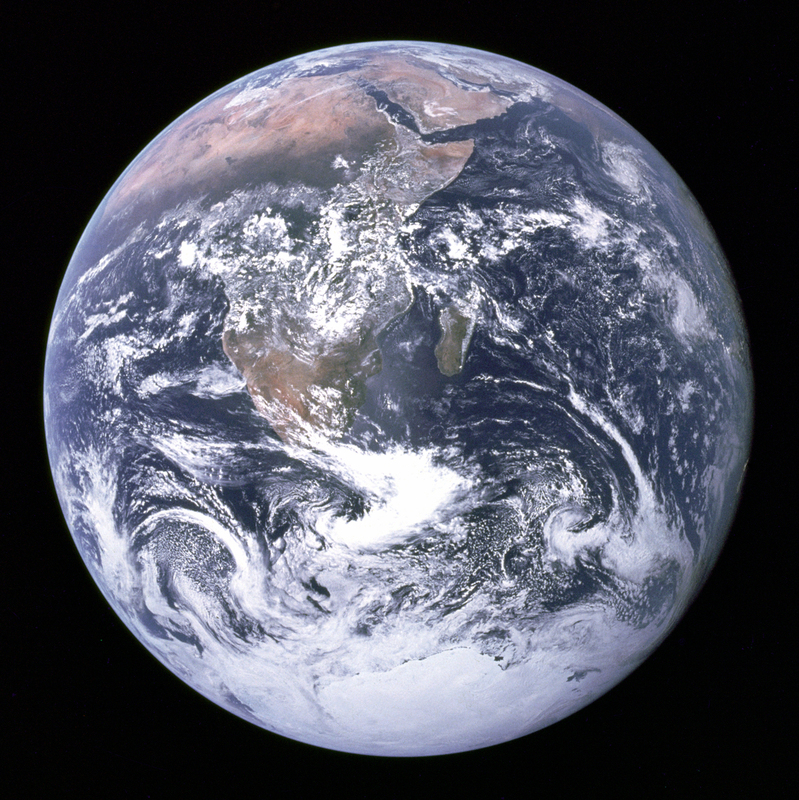 They started with a blue marble to represent the Earth, echoing the famous photograph taken on December 7, 1972, by the crew of Apollo 17 en route to the Moon and which NASA dubbed the Blue Marble.